Turmeric and honey are among some of the most powerful healing remedies you can use. Home remedies made from honey and turmeric help treat bacterial and viral infections and boost your immune system. The healing properties in turmeric golden honey may help ease seasonal allergies, improve digestion, and promote healthy gut flora. A combination of these golden ingredients has been used for centuries in Ayurvedic medicine. However, research has discovered that there is scientific backing for many of the health claims. Remedies containing honey and turmeric have been linked to treating heart disease, stomach ulcers, and getting rid of a cold quicker. In this article, you will find out about the many benefits of turmeric powder with honey. 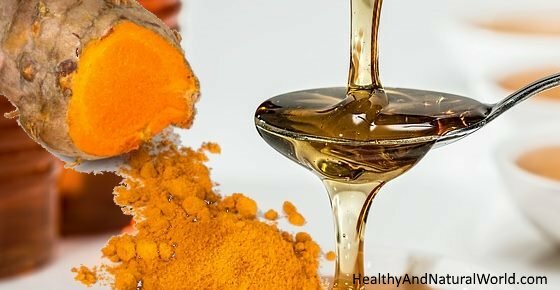 At the end of the article, you will find a recipe for turmeric golden honey. Honey is a natural healing remedy that has anti-inflammatory, antibacterial, antiviral, and antioxidant properties. The best type of honey to use for its healing potential is raw, unprocessed honey. One of the ways that honey helps keep you healthy is that it promotes good digestive health. Honey plays an important role in keeping you healthy because it contains a number of potent antioxidants. The high number of antioxidants in raw honey means that a spoonful of honey a day can help keep your heart healthy. Honey can be just as good, if not better, than traditional cough syrups to help soothe coughing fits. The immune-boosting properties of honey make this a great natural remedy for treating allergies. Even though honey is a naturally sweet substance, you can still use it in small-moderate amounts if you have diabetes. Substituting honey for traditional sweeteners can help you lose weight and also improve your immunity. Curcumin is the compound in turmeric (Curcuma longa) that contains most of the medicinal properties of turmeric. It’s the bright yellow color of turmeric mixed with honey that gives “Golden Honey” its name. When you learn about the many benefits of turmeric, it is easy to see why turmeric and honey are so good for you. Eating a mixture of turmeric and honey is good for you because it can help to kill off a number of infection-causing pathogens in your body. One of the most popular uses of turmeric as a health supplement is for its anti-inflammatory properties. Because turmeric helps to treat inflammation and pain, it is a great natural remedy to soothe symptoms of arthritis. Both turmeric and honey have cardiovascular benefits that can help to lower your risk of coronary heart disease. Consuming turmeric powder with honey also improves your digestion and helps treat chronic digestive issues. The healing power of both turmeric and honey can help to keep your liver in good health and functioning properly. Taking turmeric supplements or raw honey and turmeric can benefit your health if you are diabetic. Although the golden mixture of turmeric and honey has many health benefits, there are some precautions you should be aware of. Also, infants under 1-year old shouldn’t be given honey as it can cause a bacterial infection. Turmeric. Turmeric and curcumin are generally well tolerated by most people. However, in large doses, curcumin can cause digestive upset, headaches, and skin rashes. (16) Also turmeric can interact with some medication and may not be suitable for people with some health conditions – find detailed information in this article. Add the turmeric powder and the black pepper to the honey and mix well until smooth. If you’re also using lemon zest and apple cider vinegar, add them as well. Put the mixture in a (preferably) glass, air-tight container for up to two weeks (don’t consume it if it develops a metallic taste). Related: turmeric should be avoided by these people.